What makes our fractional skin treatment different? A full face can be treated in less than 20 minutes with minimal downtime when compared to traditional resurfacing. There is minimal discomfort with topical anesthetic, and you will see significant improvement of your skin with the treatments. Fractional skin treatment keeps downtime to a minimum by only treating a “fraction” of the skin’s surface, leaving healthy tissue to assist in the rapid healing process. Within days , new skin takes the place of older, sun-damaged skin. What’s more, the laser stimulates new collagen growth, so you will continue to see improvement in your skin’s texture and tone for up to nine months. Following treatment you will notice some swelling and redness for a few days. Depending on the aggressiveness of treatment, the redness may last several weeks. Your doctor can suggest a make-up that can be applied to cover any redness so that you can quickly resume your regular activities. After the procedure, you will be given specific instructions on properly maintaining your new appearance. Results from eCO2 deep resurfacing therapy can be long-term and noticeable. Ask your physician today to schedule a consultation for this dramatic skin treatment. The fractional CO2 laser heats water within the surface layers of the skin, causing both the water and the tissue of the skin to turn to vapor. Every time the laser passes over the skin, some of the outermost layers of the skin are removed in a precise and controlled way to the appropriate depth. 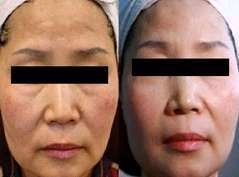 WHAT IS Benefit of FRACTIONAL SKIN RESURFACING? Fractional skin resurfacing treatment helps to reclaim your skin’s youthful texture and tone, leaving you with a lasting healthy glow. This approach has been used to treat fine lines, wrinkles and discolorations caused by sun damage, as well as to treat acne scars. Patients who have had eCO2 fractional skin treatment have reported significant results, often after only a couple treatments. Your physician will work with you to customize a treatment plan specific to your skin and treatment objectives based on your skin type, desirable down times etc. Speak to your doctor about scheduling a personal consultation to learn more about the procedure.